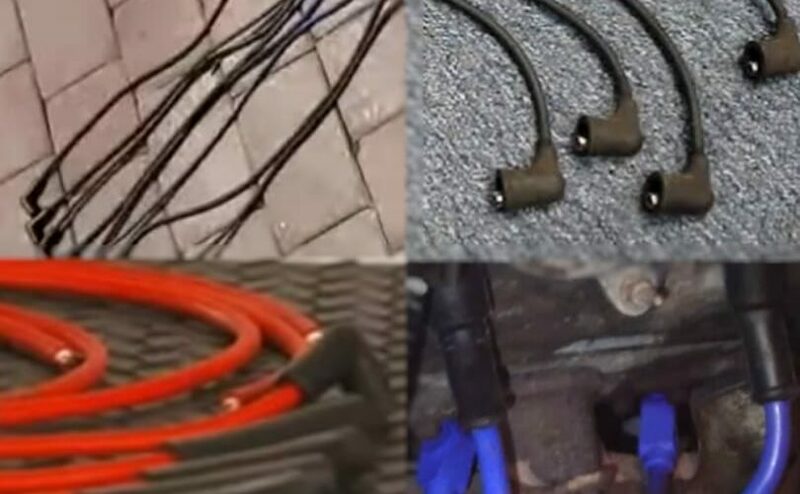 Best Spark Plug Wires for Harley Davidson Reviews: Top-5 in April 2019! You all know what spark plugs are, and you all know about replacing spark plugs and the issues related with these little components. However, the spark plug is only as good as the wire that leads the electricity to its electrodes. 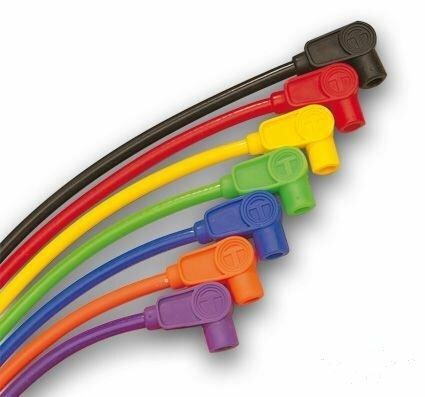 Those plastic looking wires that come with colorful boots (or black, but that’s a color too), are as important to the system as the spark plug. As such, you need to invest in a good spark plug lead. Now consider this, the electricity passing through the lead, combined with the spark plug connection will create extreme heat and electromagnetic pressures along the lead. As such, they need to be made from highly resistant materials, resistant to heat, to electrical conductivity and to external wear and tear. The core components have to be made out of high-grade materials, and you will find the best leads are made of multiple layers. These include the electrically conductive core, usually a coated stainless steel or highly conductive and elastic metal component. Insulation layers for heat, elasticity, and electricity. The cover or sheath has to be made of a very rugged, elastic, strong, thermally resistant, and electrically insulating material. The boots have to be able to protect under extreme heat and vibration. Let’s take a look at the 5 best spark plug wires for Harley Davidson motors. This is the SUMAX 20231 Custom Plug Wire RED for 1999-2017 various applications. The Sumax 20231 are Red colored wires that are made from high-temperature silicone cover and boots to withstand temperatures of up 600º F.
Theism model comes with a spiro-pro core that gives you 10 times the conductivity of standard carbon core wire models. They also run at very low resistance, and this provides a cooler run that makes this wire last longer by 3-4 times that of a standard carbon core wire. 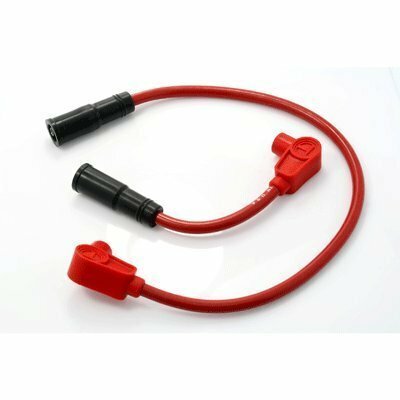 These wires work with both electronic and point-type ignition systems and are engineered to fit spark plug terminal nut s. The end boot angle is set at 90o, and the wire diameter is 8mm. The length of this pair is 19 1/2 in. and 7 1/2 in. This is a very basic but excellent pair of spark plug wires and will last longer than the standard basic factory models. This is the Blue Taylor Spark Plug Wires and leads for various 2009-2015 applications. This is the Taylor Spiro-Pro 8mm Wire, the most popular choice by most riders. This model comes with a blue finish and has two layers of silicone, in the inner core and outer jacket. This maintains the spiro pro advantage and allows these wires to perform up to 600º F.
The Taylor model uses a fluorocarbon conductive material coated stainless steel wire. 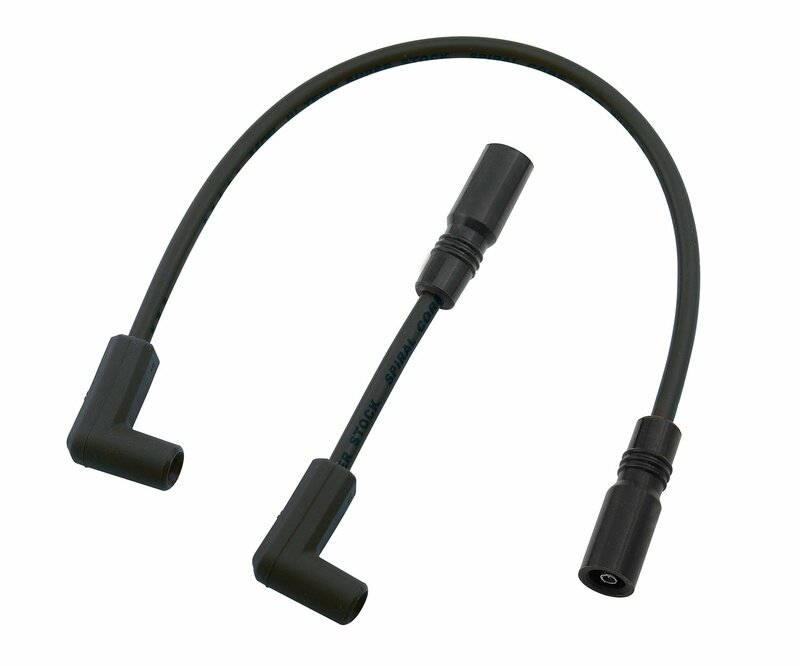 This delivers 350 ohms per foot resistance, as such, these leads deliver better firepower to the spark plugs. The design of these wires includes an RF interference shield; this is imperative to have when your system has a multi-spark discharge, electronic ignition. You can get this 24” model in a variety of colors, and they come in pairs. This is another popular brand that is used by many riders; it’s also a generic model that fits many applications and is used in street and performance applications. The Streak model is an 8mm wire that comes with an additional layer of silicone, so it’s a triple layer model that provides excellent heat protection and overall spark performance. The layers are the jacket, the insulation, and the core wrap. The Blue Streak® wire withstands up to 600°+F and has a patented conductor that offers low-resistance wire (15 OHM/FT). The patented wire uses a wound ferrite core technology that delivers a quiet, static-free operation for high-performing electronics. This is supported by the extra thick insulation including a patented heat reflecting coating that resists contaminants and abrasion. This model comes with a 12” and a 19 ¾” lead with a 90° boot on each. This is an advanced wire system and is a performance grade wire. If you want to have an advantage on the road and off-road, this is the wire to get. However, what really stands out is the price, which is truly amazing when you consider how far advanced it is over the completion. 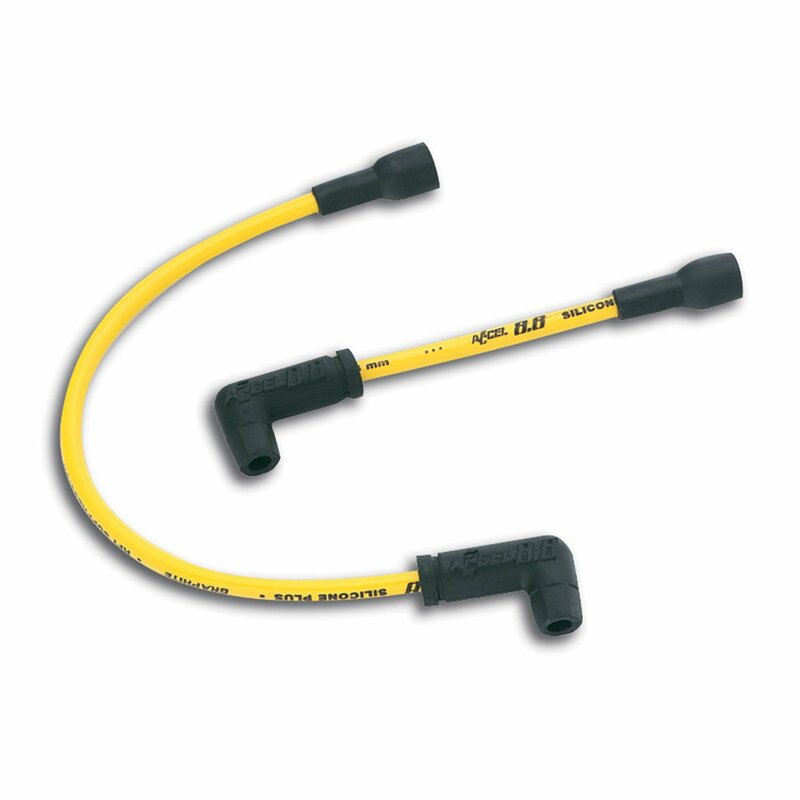 This is the ACCEL 172086 8.8mm Yellow Custom Fit Spark Plug Wire Set for 1986-2006 XL applications. The ACCEL Motorcycle 8.8mm spark plug wire is made using stainless steel terminals covered by silicone boots. This model features and RFI suppression core that reduces interference to the electronic ignition system. This kit includes a pair of leads, a 21” and a 9” lead. This is a no-nonsense standard pack, great for many XL applications, and comes at a relatively OK price. It stands out because it’s a very reliable brand. This is the ACCEL Motorcycle SuperStock Spark Plug Wire Sets 171100-K for various 2006-2017 applications. This is the premium ACCEL lead, and it comes with an 8mm silicone jacket and insulation, providing you with added strength from an ultra-strong Aramid and fiberglass braiding of the core. This braiding adds to the stretch and vibration resistance properties, so you get an extremely versatile lead that has a low 500 ohms/ft. resistance core. This model withstands up to 500oF and comes with 90o silicone boots. The fitment will take on any spark plug nut and comes with a Spiro-core for added performance. 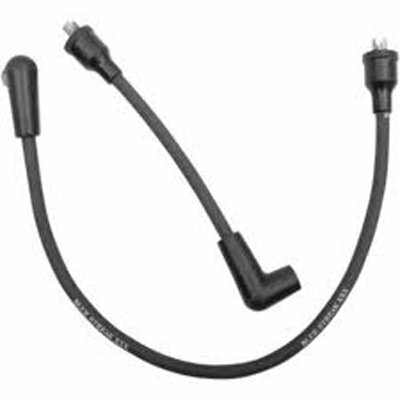 This is a great wire lead for many Harley Davidson models and is specially designed for all Softail applications. Pricewise its up there, but well worth the investment for the level of quality that you get. Spark plug leads need to be checked more often than the plugs, and only because they are prone to more external damaging conditions than the protected spark plugs. There are a number of ways to check the leads, and there are different tests to perform to check for different issues. Checking your cables for damage is imperative to maintain a steady flow of electricity to your spark plugs. Here are the common signs beyond the “engine light” warning. Start off by looking for visible damage in the form of melting, cracking, abrasion, and discoloration. The constant engine vibration will lead to a loose connection, and this causes an increase in voltage required to ignite the spark plug. Added voltage leads to a damaged ignition coil. Check the connection to see that it is firm. Engine heat is the obvious source of damage to the outer insulation as well as the boot. When a boot gets damaged, it obstructs proper seating, and when wire insulation is damaged, it will cause the voltage to skip the gap and go directly to the ground leading to misfires. Signs: cracks, tears, rips, holes, skims, etc. Any form of abrasion to the sheath will open the core to eternal conditions; these will lead to corrosive substances and water to impede the flow of electricity, as well as create cracks and eventual complete tears in the lead. You can also test the leads even if no visible damage is noticeable, just to check their performance and integrity. There are a number of tests to perform. Checking the leads using a digital multimeter. You connect the probe to each end of the lead and read the result. It should read no more than 12,000 Ohms per foot. If the readout is higher than this, replace the wire. Checking for Shorts, you will need a 12 volt light test. You attach the test light to a running engine and run it along each spark plug wire, if a spark jumps out from the wire to the light, you have a case of broken insulation. You need to replace the wire. Make sure you don’t touch any metal parts of the bike while performing this test. Spark Test using a spark tester. You remove one of the plug wires and attach a spark tester to the wire and the engine ground, you then crack the engine and check for a good result. A good spark is blue-white and visible in daylight. On some occasions the problem will be with the distributor cap, you can check for this by attaching the tester to the distributor end of the coil wire. Then crank the engine to see if there is a good spark, if not, the issue can be with the distributor cap, rotor or the spark plug wires, and as such, try the test with a replacement wire just to be sure.